Keeping up the pressure against development of unauthorised colonies in and around the city, the Greater Ludhiana Area Development Authority (GLADA) has recently uploaded names of 1,007 illegal colonies on its website to caution the general public against purchasing plots and investing their money in them. The Deputy Chief Minister’s initiative to withdraw extra force allotted to politicians/officials and removal of red beacons from the vehicles to send a message that the government is against the “VIP” culture is a mere eyewash, as no action has been taken against the big fish so far. Many officials are overstaying in plush upmarket official residences on the Mall Road and surrounding area of Rakh Bag, despite being transferred out of the district. It seems that the Ludhiana Municipal Corporation has turned a blind eye to the safety of residents, as the city roads are fast turning into death traps. 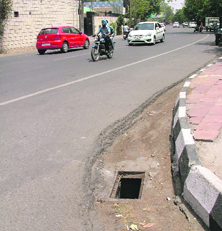 Several ditches and manholes without covers are a common sight posing danger to the lives of residents. Open manholes, storm sewers, big potholes and even ditches, which can be seen on the main as well as on the slip roads, can lead to accidents anytime. Despite the fact that many people have already fallen victim to such deathtraps yet the civic body has not paid any heed to the safety of residents. From cosmetics, fashion accessories, food products to medicines, more than 50 per cent of the city market is flooded with duplicate products. The branded T-shirt that you are probably wearing may not even exist in the design portfolio of the company. It may have been produced by a small-time designer who sits in the busy lanes of Ludhiana. The city police arrested cloth manufacturer for allegedly using fake logos of top international brands like Tommy-Hilfiger, Reebok and Adidas on clothes and selling them in the open market. The police has recovered around 1,000 T-shirts on which fake logos of international brands were used. The small-scale industry from Ludhiana is planning to expand in Andhra Pradesh, as the government of the said state is providing some benefits to it. First the industry is planning to shift and if the things go well there then they will finally wind from Punjab as it is becoming impossible for them to continue running from here due to various reasons. A woman had a miraculous escape after a tractor-trailer carrying sand overturned in the Salem Tabri area here today and she lay buried underneath the sand for nearly 20 minutes. The incident took place in the morning when the victim identified as Kanta was going towards New Sabzi Mandi. Burglars struck at a house in Janak Puri and fled with Rs 50,000 cash by injuring a 72-year-old former postal department employee. Ludhiana: Taking cognisance of depleting groundwater level and deteriorating soil health coupled with severe labour scarcity in Punjab, Punjab Agricultural University (PAU) is laying emphasis on the development of resource conservation technologies (RCTs). Dr Baldev Singh Dhillon, Vice-Chancellor, PAU, said Punjab agriculture was passing through a critical stage and promotion of RCTs was the top priority of the university. 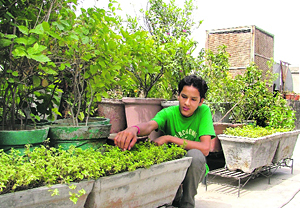 More and more people in the city have started making space for kitchen gardens in their homes. Not only as a trend to have green hands, but also because of the rising health concerns, people are turning organic in a more homely manner. More residents are preferring to go for home-grown food. The trend is being driven as much for health reasons, as much as a hobby. The Nagar Panchayat of Malaudh has got its first woman president in Indu Puri in the election held yesterday evening. Varinder Jit Kaur, a Congress-supported councillor, was unanimously elected the vice-president. 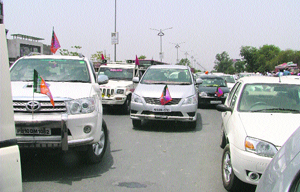 Three of the seven SAD-BJP councillors stayed away from the election of the main chieftainship of the civic body. The Akali leaders lobbying hard for becoming the Ludhiana Mayor are “desperately” waiting for Deputy Chief Minister and Shiromani Akali Dal president Sukhbir Singh Badal, who is on a foreign visit these days. The Rotary Foundation of Rotary International has conferred Regional Polio Eradication Award on Shub Karan Gupta, national member of the Polio Pulse Committee and past district governor of RI dist 3090. A police-public meeting to discuss the drug menace was held at Milk Bar, Biza. The DSP Khanna, Prithipal Singh, addressed the chemists, shop keepers and people of the area during the meeting. The DSP said that drugs were spoiling the youth of the village. He urged the youth to stay away from drugs for their own health and for the welfare of the society. The DSP appealed to the chemists not to sell intoxicants. He directed them to give medicines to only those persons who had written slips from registered doctors. He said that the district police would honour those persons who give information about drug sellers. After two students fainted while waiting in a queue for submitting admission forms at Punjabi Bhawan, educationists have urged the Punjab School Education Board to make the process online. Although it's been years since the CBSE introduced vocational courses and streams at higher secondary level, most of the city schools have not even started the courses. Those commuting on the Ferozepur road had to go through a harrowing time as a large number of workers and leaders of the Akali Dal-Bhartiya Janta Party alliance, who had come to attend a function, parked their vehicles haphazardly on the road near KC Marbles. Guru Angad Dev Veterinary and Animal Sciences University (GADVASU) conducted the Common Entrance Test 2012 for BVSc & AH (bachelor of veterinary science and animal husbandry), BFSc (bachelor of fisheries science) and BTech (dairy science technology) at RS Model Senior Secondary School, Shastri Nagar, Model Town, and College of Veterinary Science, GADVASU. In a bid to check child labour, the Railway Police Force (RPF) has rescued nine children aged between 8 and 14 from the railway station. To teach them and their parents/guardians a lesson, the Child Welfare Committee (CWC) has decided to send them to Children Home, Kurali (Ropar). Arvind Kumar, from an NGO, said a meeting of the Advisory Board of Childline was held under the presidentship of ADC Rishipal Singh here today. The Khanna police organised a seminar to mark the International Day Against Drug Abuse and Illicit Trafficking on Tuesday. Speakers apprised youngsters of ill-effects of drugs. Hair bands are back. After years of dormancy, hair bands are again finding their place on heads, all resplendent in their colour and design. These are now there, from the high-end stores to that corner accessories shop. Girls and women are seen sporting these with aplomb. Following the call given by the United Forum of Bank Unions (UFBU), the Punjab Bank Employees Federation held a demonstration at Miller Ganj office today. Punjabi Sahit Academy has welcomed the decision of Guru Nanak Dev University to make Punjabi a compulsory subject at the graduation level. A team of health officials today seized habit-forming drugs worth Rs 2,65,000 from a medical store at the Pindi street. Following a tip-off, the police arrested 12 gamblers and seized over Rs 1 lakh from their possession following a raid here today. Four persons were injured and two vehicles were damaged after an over speeding pick-up truck went on a hitting spee at New Sabzi Mandi in the Salem Tabri area here today.